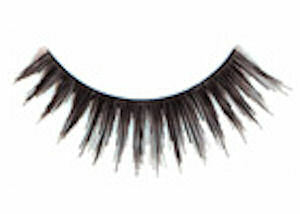 Add our "On the Go 15" pair of top lashes to your "Must Have" beautifying list. Bat your baby blues with these, as they enhance the eyes of women of all ages. Heads up, though: remember to put on the glue first, so you will have your look complete, ready for long wear. This product is handmade from human hair, thus looks completely natural when put on. Stick on with the glue and stay confident throughout the day.